Click on the Dive Centre below to visit their website. 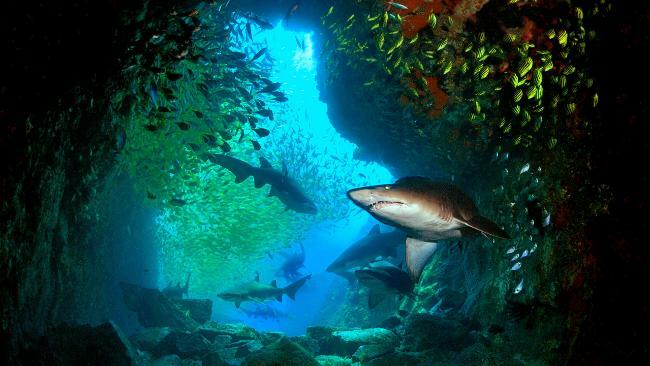 One of only a few true ocean cave dives in Australia, it runs 125m right through Fish Rock. It lies two kilometres south-east of Smoky Cape and is home to an unique ecosystem. The temperature inside the cave is always warmer than the surrounding ocean and the water is always clear. Although prone to current, it is this current that brings an enormous amount of nutrients to the area that in turn attracts the vast volumes of fish life that are so prolific here. The shallow entrance of Fish Rock Cave is at a depth of 12m and is a large naturally lit cavern. Fringed by pink gorgonian corals it is teeming with enough life to fill an entire dive. Grey Nurse Sharks often rest in the shallow entrance of the cave. This also presents an unparalleled photographic opportunity for novice and experienced photographers. At 5m there is a bubble cave which is always good for a chat with your dive buddy. The deep entrance to Fish Rock Cave is at 24m. During certain months of the year Grey Nurse Sharks congregate in the deep gutter offering photo's of multiple sharks at once. You are also likely to see resident black cod, large wobbegong sharks, black rays and giant cuttlefish before ascending up one of the two chimneys into the main section of the cave. 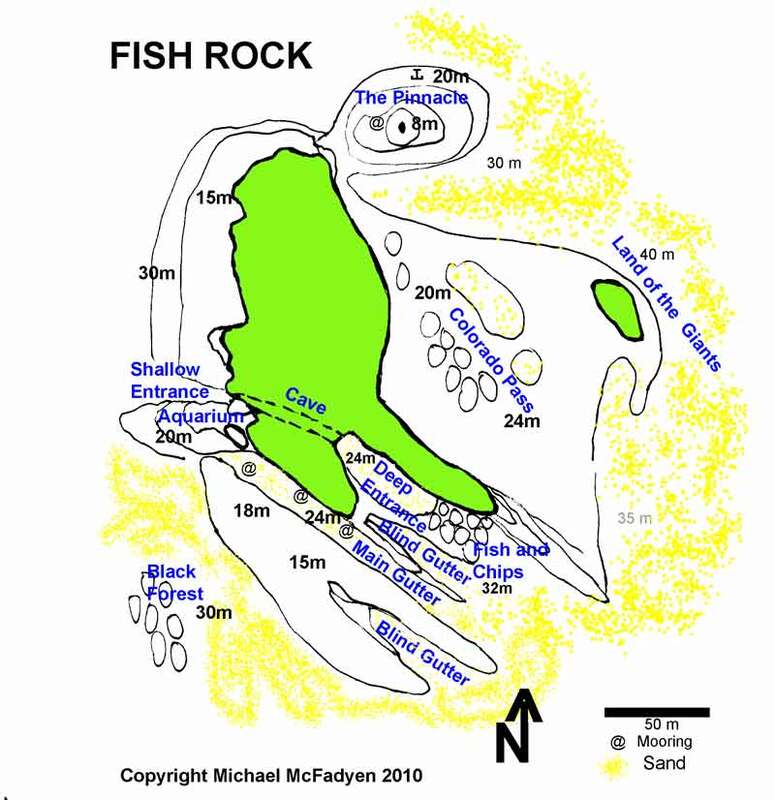 The AQUARIUM is situated at the south western corner of Fish Rock close to the Shallow Entrance to Fish Rock Cave and leads into the main Shark Gutter. An amazing abundance and diversity of marine life congregate here especially when there is current present. White eyed moray eels live in the small boulders, there are resident green and loggerhead turtles who like to rest in and around the Aquarium. Macro life is superb - juvenile box fish, numerous and unusual nudibranchs including large Spanish Dancers, banded coral shrimp. Other highlights are large pelagic such as kingfish; octopus, cuttlefish, anemones and clown fish, feather stars, butterfly fish, angel fish, southern fusiliers and friendly blue groper. Located on the southern side of Fish Rock are the SHARK GUTTERS. Three massive gutters which shelve to a depth of 16m and descend to a depth of 35m. Grey Nurse sharks are found here during most of the year, with large numbers being sighted from early May through to August. These majestic creatures are a must to dive with, and are used to cruising past divers eager to catch a glimpse. The PINNACLE is a spectacular (submerged) rock formation rising from 30 - 35m up to about 8m where there are two peaks. It is situated on the north eastern end of Fish Rock in the path of the ocean current that usually runs from north to south. As such this is a special dive site that can only be dived when the current is not too strong! 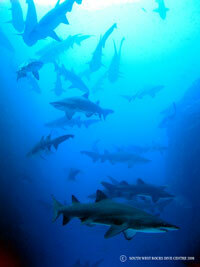 A favourite spot for the Grey Nurse Sharks and divers can often see 20 to 30 plus sharks in the sand gutter below. The northern side of the Pinnacle is also a favourite with some of the largest Ornate and Spotted Wobbegongs, green and loggerhead turtles, large lionfish and large stingrays ("bull rays") . The sheer sponge walls of the Pinnacle are perfect for octopus, nudibranchs, juvenile slipper and painted crayfish and for hanging out watching the fish life - look out for large schools of banner fish and southern fusiliers plus bait fish being hunted by the pelagic. Occasional sightings too of schools of Eagle rays and very large Queensland Groper and Black Cod accompanied by a variety of colourful wrasse, leatherjackets, batfish and bullseyes. A great dive site, especially for the second dive of the day. Green Island is just north of Smokey Cape lighthouse, and is only a short distance from shore. Surrounded by rocky reefs, the island is alive with a huge variety of fish, large rays and turtles. Grey Nurse sharks are commonly seen here in large numbers. On a typical dive you can see dozens of very large drummer, hundreds of bream of quite good size, giant dusky flathead, thousands of yellowtail, large schools of blue morwong and luderick as well as dozens of free-swimming eastern blackfish. Located just south of Smokey Cape lighthouse. The shallow depths with rocky crevices, tropical corals and thousands of schooling bait fish for a relaxing and interesting second dive. Additionally, yellowtail, sea pike, silver sweep, pomfreds, nannygais, bullseyes, dozens of moon wrasse, blue gropers, comb fish, resident turtles, egg cowries, lionfish, nudibranchs and wobbegongs make this site a photographer's paradise. This is a rocky reef just a short distance off Trial Bay Gaol. A shallow and easy relaxing dive that can be done from shore in favourable conditions. A huge variety of fish, invertebrates and crustaceans can be found at this site, which is also well known for the numerous moray eels and octopus occupying every crevice on the reef. Schools of bait fish and squid congregate over the reef waiting to be fed upon by passing pelagic species, and large school of rays are a common site. This is a small reef only a short distance from shore. The reef is covered with soft corals and colourful sponges, and provides for an extremely relaxing dive. Macro photographers will especially enjoy the numerous species of juvenile fish, nudibranchs, decorator crabs, hinge beak shrimp, cowries, moray eels and cuttlefish. 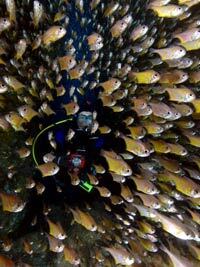 The circular shaped reef is very easy to navigate around with your dive buddy.